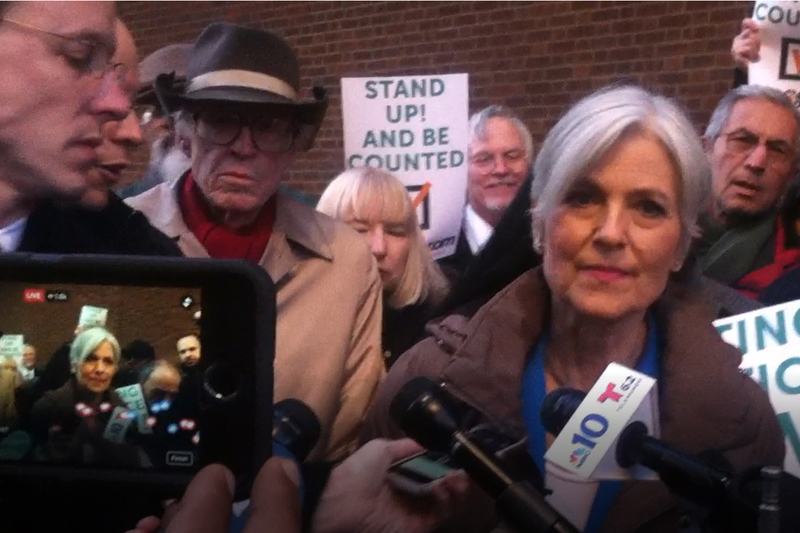 Stein’s Team Pleads the Case for a Recount in Pennsylvania: Too Little, Too Late? More than 4,000 voters in a single Pennsylvania county headed to their local polling places on Election Day, stepped into the booth and, at the moment of decision, seemingly cast their vote for no one, records show. Not for President-elect Donald Trump nor Hillary Clinton. Not for Gary Johnson nor Jill Stein. Nor did they pick a single candidate for US Senate, Congress, state attorney general, state legislature, or town supervisor. Yet machine records confirm that these Montgomery County voters went to the trouble of showing up. They then either decided to withhold their vote or something prevented their votes from being recorded. This mountain of so-called No Votes, regarded as “implausible” by Stein’s legal team, is now at the heart of her appeal for a recount of Pennsylvania’s presidential race that awarded the state’s 20 delegates to Trump. Maazel said that a “juvenile password structure” and “antiquated technology,” make these machines — used around the state and in much of the country on Nov. 8th — especially penetrable by hackers and malware. With a federal judge promising a ruling Monday morning — and a Tuesday deadline bearing down on Pennsylvania to certify the results — Stein’s lawyers say that the No Votes suggest that machines tabulating the vote simply wiped them from their memory. In all, Montgomery County’s election records show that 4,087 ballots out of nearly 450,000 cast there were registered as No Votes. Montgomery, a suburban community of 750,000 north of Philadelphia, supported Clinton over Trump by 21 percentage points. 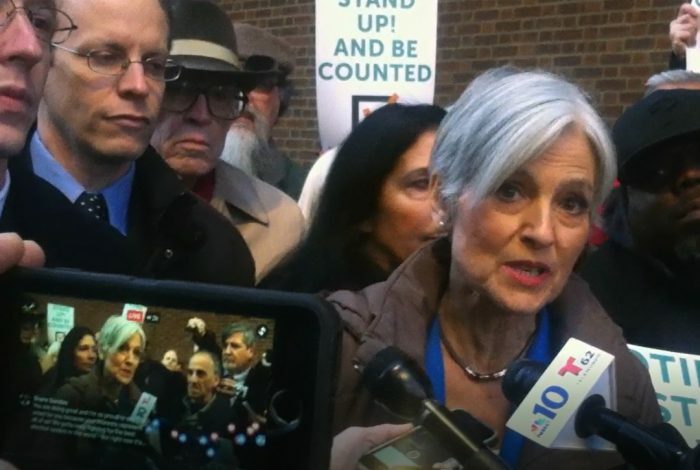 “Thousands of votes almost certainly did not count,” said Stein’s chief lawyer on the case, Ilann Maazel, at a hearing Friday in Federal District Court in Philadelphia. Maazel said that a “juvenile password structure” and “antiquated technology,” leave these machines — used around the state and in much of the country Nov. 8th — especially penetrable by hackers and malware. His assertion was dismissed as a pipe dream by an expert witness provided by the state attorney general. Weeks ago, Pennsylvania loomed as a possible linchpin in the recount effort, but with the recount in Michigan halted and Wisconsin winding down, Trump’s hold on the election is secure. And a significant shift in the results are unlikely in Pennsylvania, where Trump leads Clinton by more than 68,000 votes. Instead, Stein and her lawyers say that the rights of voters are at stake and that a recount and forensic testing of machines might reveal weaknesses in the equipment. The hearing, lasting two-and-a-half hours, starkly framed the issues that have played out as well in Wisconsin and Michigan, with Stein’s side pointing to irregularities, and attorneys for the state and Trump saying the recount movement is fueled by paranoia and dismay over the outcome. Judge Paul Diamond criticized Stein’s lawyers for “creating a legal fire drill” by waiting until Nov. 28, the last day possible, to submit a request for a recount. If the results are not certified by Tuesday, the vote could be thrown to the state legislature, or more dramatically, Pennsylvania’s electoral votes could be discarded, as if the election there never happened. While Stein’s lawyers argued that thousands would lose their vote without a recount, the judge, along with Tabas, said that the votes of millions would be imperiled if the Tuesday deadline was missed, just seven days before electors in every state meet to cast their votes for president and vice-president. Mindful of this, Maazel proposed a scaled back, two-tier approach. He called for a deep forensic dive into DRE machines in six of the state’s 67 counties and a hand recount of just one percent of the ballots in 17 precincts — roughly 250,000 votes — where so-called optical scanners were used to tabulate paper ballots. The scramble to beat the clock began in the courtroom, with Diamond asking the two sides to huddle to determine how long the assessments would take. They agreed the effort could likely be concluded in a “long” day and a half, just before time runs out. Still, the judge offered only small hope to Stein’s lawyers that he would allow a recount to go forward, saying they had not supplied any proof that a single machine had been hacked or a ballot tampered with. “You’re risking disenfranchising six million voters versus speculation,” he said. Breakdowns that somehow transformed more than 4,000 ballots into No Votes went mostly undetected by voters who left the booth thinking their selections had been registered. But hundreds of voters discovered the mistake within moments, when the machines recorded they had shown up but kept returning their ballots with no votes cast. In the following days, many of these voters embarked on a tortuous bureaucratic trail, said Maazel, the Stein lawyer. They were shunted from one office to the other as they tried to submit a petition to have their ballot counted, and those who persisted were confronted with filing fees of as much as $500 or ultimately told they had missed a deadline. Most, Maazel said, just gave up. Because petition deadlines varied wildly from town to town and because towns did not formally post them, voters in this predicament were deprived their constitutional right to protection against disenfranchisement, Maazel said. Shamos, the attorney general’s expert witness and a computer-science professor at Carnegie Mellon University, said that Pennsylvania’s tabulation methods, lacking a centralized computer, were impervious to a bad actor trying to hack into it by altering the software. Attackers, he said, would have to lie in wait for four months as machines were readied and tested before being brought to polling places a few days before the campaign. He acknowledged that typical voting precincts — such as schools, churches and libraries — often went unguarded, even in the days leading up to the election. Alex Halderman, a University of Michigan computer-science professor, testified for the Stein side that there were two basic ways Pennsylvania’s machines were vulnerable to hacking, either by physically tampering with a computer chip or by transferring infected files from one machine to another on ordinary flash drives. “Putting myself into the role of attacker, with all its vulnerabilities, I would hack Pennsylvania,” he added.